The Cabin is a detached lodge placed near the South Wales town of Pontardawe. It provides one king-size bedroom and a shower room, with a sofa bed in the living area the property can sleep up to four people. The interior also comes with an open-plan living area with a kitchen, breakfast bar and sitting area. To the outside you will find plenty of off road parking, a decked veranda with furniture and an enclosed lawn with a hot tub. 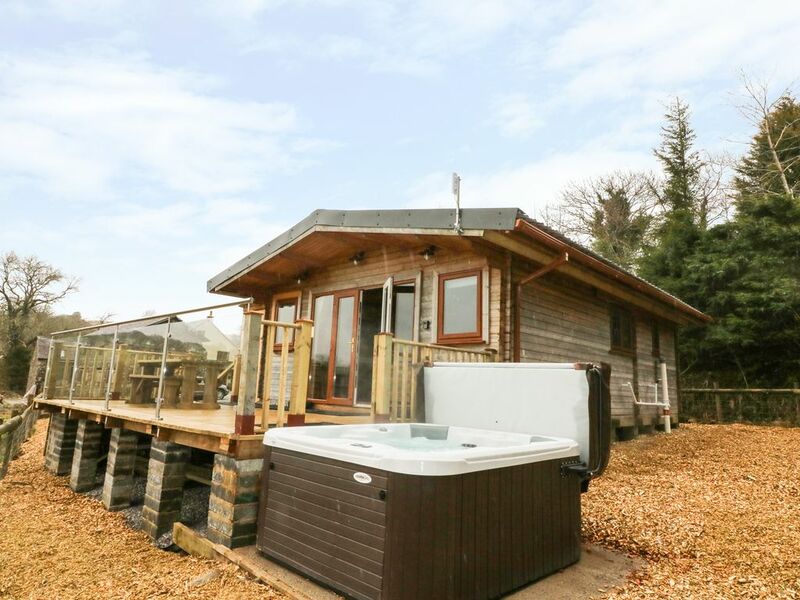 The Cabin is a stylish property in a wonderfully remote location. Amenities: Electric panel heating. Electric oven and hob, microwave, fridge, dishwasher, TV with Freeview, WiFi. Fuel and power inc. in rent. Bed linen and towels inc. in rent. Ample off road parking. Decked veranda with furniture and hot tub. Two well-behaved dogs welcome. Sorry, no smoking. Shop and pub 4 miles. Note: Property accessed down off road track, gates need to be opened and closed due to livestock. Town: A town in the Vale of Glamorgan, South Wales. Pontardawe provides a range of amenities including an arts centre and number of pubs, the Swansea Canal runs along the town. It sits in an spot for exploring South Wales, in between the Brecon Beacons National Park and Swansea. The Afan Forest Park is nearby and offers walking and cycling trails as well as a mining museum. Electric panel heating. Electric oven and hob, microwave, fridge, dishwasher, TV with Freeview, WiFi. Fuel and power inc. in rent. Bed linen and towels inc. in rent. Ample off road parking. Decked veranda with furniture and hot tub. Two well-behaved dogs welcome. Sorry, no smoking. Shop and pub 4 miles. Note: Property accessed down off road track, gates need to be opened and closed due to livestock.